It was my birthday at the end of July and as I’m not really into clubs much anymore all I wanted to do was stay in, eat cake and hang out with my friends! So I decided on an Afternoon Tea Party & Cocktails. We all got dressed up, I made a table full of goodies, and we spent the day eating cake and drinking tea, then as the evening came, we hit the cocktails, played games and had a brilliant time! I wanted to create this guide to help you have a great afternoon tea party too! I started a few days in advance by making these fruit scones. I put them in the freezer to keep them fresh, then took them out the night before the party. If you have any gluten free guests try this scone recipe from The Gluten Free Alchemist, or for vegan guests try this recipe from Wallflower Kitchen. I also made my own raspberry jam to go on the scones, which I made a few days in advance too. And of course the scones were not complete without clotted cream! So I made sure to get a couple of tubs in for the party. If you don’t want to make your own jam, there are so many quality options in the supermarket now, I would suggest buying a more premium option for the party – it is a special occasion after all! A classic Victoria Sponge Cake was the centre piece of the table. I made a basic sponge mix and sandwiched the two halves with jam and fresh cream in the middle. You can’t go wrong with a Mary Berry recipe or my Strawberries & Cream Cake is sure to impress! For the second cake I wanted something a bit different so I made this Spiced Carrot Loaf Cake with Cinnamon Cream Cheese Frosting, it was so yummy! The recipe is from BBC Good Food, I omitted the walnuts and sultanas. For savoury lovers and also to provide a break from all the sweet treats, I made three types of finger sandwiches – salmon and cream cheese, cucumber and cream cheese, and ham. They were very popular and I ended up having to make more half way through the day! I also provided some crisps for nibbling on. There are so many sandwich filling options and I’ve listed some more ideas below, don’t forget to check if any of your guests require gluten free bread. I bought a good selection of tea to suit everyone’s tastes, I included decaf and fruit teas. I also provided soft drinks and juices. If you have a teapot you can make up a pot of tea for everyone. Later on we moved onto cocktails. This is a Cosmopolitan, a delicious mix of vodka, triple sec, lime juice and cranberry juice. Throughout the night I also made lime daquiris, pina coladas and long island ice teas. These are all classic cocktails and the recipes are readily available online, try Social and Cocktail for 100 cocktail recipes. We played some awesome games. First we played Cranium which is a fairly well known family game, well to everyone except me! I had never heard of it but apparently a lot of people play it at Christmas. Later on we played the hilarious Cards Against Humanity – which I highly recommend. Games are such a great way to get everyone involved and interacting with each other, especially if your guests don’t all know each other well. I had such a fun time and I highly recommend this kind of get together if you can’t be bothered with the hassle of going out (and you love cake!) Staying in is much more fun! I made everything myself for the party, but you could get your friends to bring a bake each to lessen the workload. If you do want to make everything yourself, the freezer is your friend! You can freeze the cakes (undecorated) and the scones in advance. I hope you have fun! 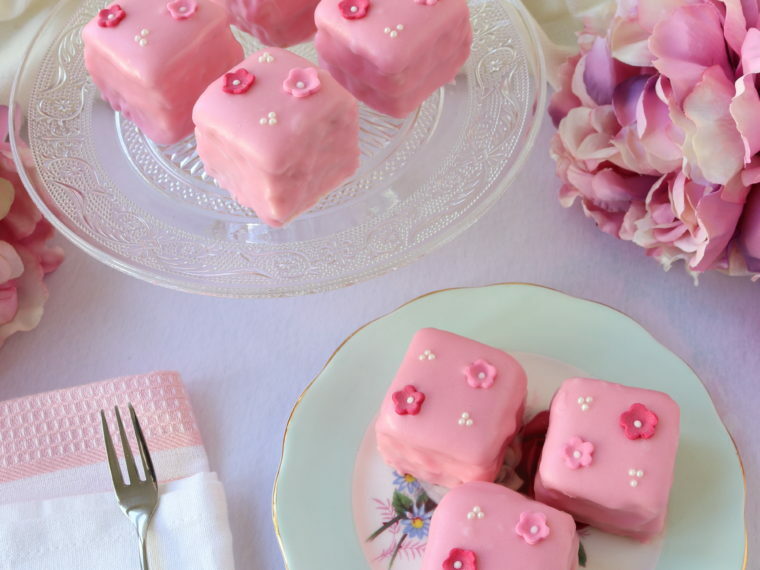 Let me know in the comments if you have any other tips for the perfect afternoon tea party! Looks like you had a fabulous time! Don't you wish you could have birthdays more often?! I'd say I can't believe we both decided on tea parties for our birthdays, but as cake / tea loving food bloggers, I would say that's pretty standard. Looks like so much fun though, and love all of your hair! Vintage looks rocks my socks off. That vicky sponge though…. that looks good. I would want a slice of that. Haha very true, typical food blogger party! I loved my hair style too, I did not want to take it out! Looks like a blast! Fantastic selection of cakes…… I'm impressed at all your hard work. Well done and happy happy birthday! Thanks Kate! Could not have done it all without the freezer, thankfully a lot can be made and frozen in advance!